The human race’s first ever interstellar space craft is about to leave the Solar System. 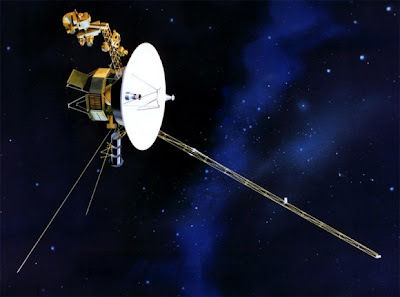 With over 34 years and almost 18 million kilometres on the clock, Voyager 1 is busy passing through a stagnation layer marking the very edge of the Sun’s influence, which is turning out to be a rather strange place. The Sun has a powerful magnetic field, and pumps out a stream of energetic charged particles called the Solar Wind. But interstellar space has its own magnetic field and particles which collide with the Sun’s, forming a vast shock-wave similar to the bow-wave in front of a moving ship. The stagnation lies in the middle of this layer, and this is the region in which Voyager 1 now finds itself. For the first time since it was launched, it’s sensors are measuring an average solar wind-speed of zero (compared to the usual measured speed of several hundred kilometres per second), indicating that this is the point where the flow of the interstellar medium and the Solar Wind cancel each other out. By contrast, the local magnetic field has almost doubled in intensity — it is being “pushed back” by the interstellar field, causing the field lines to bunch up. So far this is all what scientists expected to find, but if you don’t average out the figures, things get a little more complex. The solar wind, for example, appears to be extremely turbulent out there – it is buffeting back and forth in gusts, so that sometimes it’s even blowing back in towards the Sun. There’s one other interesting measurement: The number of high-energy free electrons (What used to be called Beta Radiation) has increased a hundred-fold, and are coming from somewhere else in the galaxy. This radiation is normally shielded by the Sun’s magnetic field, and the fact that it is suddenly increasing so dramatically is another sign that Voyager 1 is right on the very edge of the Sun’s influence and will soon be leaving the nest to explore the stars.